P. 13 (at right), bold words: "Where is the reform menstrual pad Camelia available?" "Reform is a German word that means healthy or designed to be better for people. In the early years of the 20th century the term Reform was applied to clothing (especially women's underwear: not the very tight corsets, etc.) or teaching, etc. The same with sanitary napkins: more sensitive and better designed and easy to dispose of." See the word in a beautiful 3-D ad for Camelia. NEXT | covers - title & p.5 - pp. 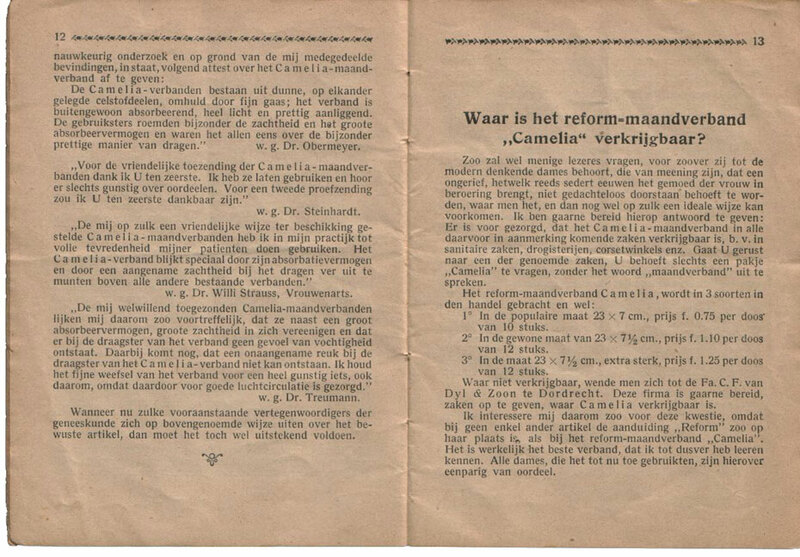 6-7 - 8-9 - 10-11 - 12-13 - 14-15 - 16-17 - 46-47 Similar American booklets: for Cardui patent medicine, Mrs. Pinkham's vegetable compound - Camelia ads: 1920s (Germany), 1930s (Germany), 1940/42 (Germany, with underpants made from sugar sacks, 1945/46), 1952 (Australia), 1970s (France), 1990 (Germany) - Underpants directory - See one of the nicest ads ever for a product (just my opinion), Camelia pads.